Joel Osteen — FALSE PROPHET! The latest "star" among the Christian world is Joel Osteen, pastor of nondenominational Lakewood Church in Houston, Texas. Osteen claims the nation’s largest congregation with over 30,000 members. Lakewood recently purchased the colossal Compaq Center, formerly home of the NBA’s Houston Rockets. After a whopping $95 million in renovations, the Compaq Center now houses Osteen’s empire called Lakewood Church. Osteen continually sells out huge arenas (at $10 a ticket) across the country. (on ebay Osteen’s tickets list for over $100—can you say $ch-ching$?) New York Times (July 18, 2005) reports Lakewood’s 2004 revenue’s of $55 million. Osteen’s book of human-potential, self-esteem, "feel good," self-help-guide titled, Your Best Life Now: Seven Steps to Living at Your Full Potential, ranks number one on the prestigious "New York Times" best-seller list. 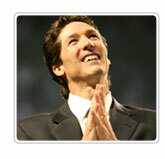 Wxyz.com writes of Osteen’s enormous popularity, "In the world of religion, he’s achieved the status of a rock star. . ." Clearly, Mr. Osteen wears the coveted crown prince of the Christian kingdom. Osteen’s message is described as ". . . simple self-help message that congregants say is both uplifting and accessible. . ." Osteen proudly wears the title of "the smiling preacher." His theology has been described as "cotton candy" theology – tastes good – but no substance. Before we examine Osteen’s disturbing theology, let us lay some ground work for our critique. Today’s Christians have been spiritually malnourished with a steady and unrelenting diet of "judge not, that ye be not judged. . .," tolerant, inclusive "junk food" doctrine until they are completely void of any spiritual discernment. May I remind you in Matthew 7 where the popular "judge not, that ye be not judged. . ." mantra occurs contains the harshest warning in the Bible exposing false prophets and exercising personal spiritual discernment. The Lord Jesus in Matthew 7:21-23 provides the most enlightening and frightening warning found in all the scriptures. Many (not a few) people that openly call Jesus "Lord, Lord. . ." and many that "prophesy in thy name. . ." and ". . . cast out devils. . ." and in the name of Jesus Christ perform "many wonderful (not hateful, but nice, sweet) works. . ."— Jesus will utter "I NEVER knew you." They were never saved. If they were ever saved—Jesus could not say, I NEVER knew you. Despite their "many wonderful works" in the name of Jesus, despite calling Him "Lord, Lord"—Jesus Christ will cast them into an eternal lake of fire, calling them "ye that work iniquity." Matthew 7 (and there are many other scriptures) is an earth-shattering wake-up call for prayerful Bible discernment. If we, as Christians do not shine the exposing light of the Word of God upon preachers, Christians or anyone and everyone, how can we possibly obey the clear admonition of our Lord and Saviour in Matthew 7:15? How can we "Beware of false prophets, which come to you in sheep's clothing, but inwardly they are ravening wolves"— if we do not "judge" who are the "false prophets"? How in the world can we even KNOW who are these "false prophets"? They appear as "sheep" or saved people, but they are "ravening wolves." There is only one way—the unchangeable, perfect Word of God. There is a very serious and very deadly Christian belief perverting Christians that says, "I can’t judge them, I don’t know their heart." The Lord Jesus Christ says in Matthew 15:19, "But those things which proceed out of the mouth come forth from the heart; and they defile the man." What comes out the mouth – is in the heart. And what came out of the heart and mouth of Joel Osteen during the June 20, 2005 interview with Larry King literally sent shivers down my spiritual spine. As a Bible Believing researcher, I have researched many topics, many cultural issues and many false prophets—but what I heard repeatedly from the mouth of Joel Osteen on Larry King clearly ranks as the most disturbing words publicly coming out of a mainstream, accepted preacher. Bar none! Before we view Osteen’s troubling statements, let me also add: we are not frivolously "sowing discord among brethren. . ." (Proverbs 6:19); we are not blindly, ". . . straining at a gnat, and swallowing a camel." (Matthew 23:14); nor is any personal malice or contempt against Mr. Osteen intended. As Bible Believers, we can disagree on certain doctrinal issues, but never the redemptive work and person of the Lord Jesus Christ. God forbid! God help us to never cease from exposing serious doctrinal errors, and make no mistake about it – several of Joel Osteen’s statements on Larry King Live were serious. Very serious. . . The first very alarming portrait of Osteen’s heart (Matthew 12:34) deals with the most important subject in the Bible—salvation is only through the redemptive blood of the Lord Jesus Christ at Calvary. Nothing is more important. Nothing is more evident in the scriptures. The following scriptures (among many) loudly and boldly proclaim Jesus Christ as the ONE and ONLY way of salvation, without any room for misinterpretation or misunderstanding. The Bible makes this crystal-clear. Other doctrines may have opportunity for argument, but not this one. At this point, even Larry King appears surprised by Osteen’s answer. Then Larry tosses Osteen a "soft-ball" to explain his previous answer. And again Osteen openly denies that Jesus Christ is the ONLY way of salvation. I’m sure some reading this are thinking, "Well, maybe Larry caught Joel Osteen flat footed. Maybe Osteen wasn’t prepared." If Osteen only had been given another chance to testify of the redemptive work of the Lord Jesus Christ, he’d get it straightened out. After Larry King opened the phone lines, a concerned Christian asks Joel to clarify his previous statement (which we just viewed). Again Osteen could easily clear this up. And here Larry really tosses Joel a soft-ball. How about a God-defying atheist? And again, Osteen will not confess that Jesus Christ is the ONLY way of salvation. Friend, the Bible is clear. There is one, and only one way out of an eternal hell and that is the blood of the Lord Jesus Christ. Not simply "a relationship with Jesus Christ." Judas Iscariot had a "relationship" with Jesus Christ, walking and talking with the Lord, and even "kissing" the Lord (Luke 22:47), but Judas went to hell (Acts 1:25). Revelation 2:15 reads, "And from Jesus Christ, who is the faithful witness, and the first begotten of the dead, and the prince of the kings of the earth. Unto him that loved us, and washed us from our sins in his own blood,"
What can wash away my sins – NOTHING BUT THE BLOOD OF JESUS! The teaching professed by Osteen that ". . . God’s got to look at your heart. . ." for salvation is wrong. It is grossly wrong. It is deadly wrong. God has already "looked at you heart." In Jeremiah 17:9, the Lord says, "The heart is deceitful above all things, and desperately wicked: who can know it?" Proverbs 28:26, says, "He that trusteth in his own heart is a fool. . ." The Lord Jesus says, in Matthew 15 "But those things which proceed out of the mouth come forth from the heart; and they defile the man. For out of the heart proceed evil thoughts, murders, adulteries, fornications, thefts, false witness, blasphemies:"
Many of you have called, written or e-mailed regarding my recent appearance on Larry King Live. I appreciate your comments and value your words of correction and encouragement. Thank you again to those who have written. I hope that you accept my deepest apology and see it in your heart to extend to me grace and forgiveness. I find it ironic and demeaning that Osteen "was unclear on the very thing in which I have dedicated my life." He was not UNCLEAR. He was crystal clear. He consistently and clearly rejected that the Lord Jesus Christ was the ONLY way of salvation! We're not talking about a "babe in Christ." We are talking about the pastor of the largest church in the nation! Here he is as an ambassador for the Lord Jesus on a very popular television show and refuses to acknowledge the very thing he supposedly has "dedicated his life"? Something's seriously wrong with this picture. . .
Osteen’s glossing, or apologizing for his serious statements, does not negate his repeatedly refusal to confess that Jesus Christ is the only way of salvation. If his answers were not so clear, nor given several chances to clarify, his apology might be appropriate. But the heart and soul of the Christian faith is the sole redemptive blood of the Lord Jesus. Without that, there exists no Christian faith. For a preacher to repeatedly refuse to confess that Jesus Christ as the only way of salvation is without excuse, nor apology. 1 Peter 3:15 admonishes the Christian: "But sanctify the Lord God in your hearts: and be ready always to give an answer to every man that asketh you a reason of the hope that is in you with meekness and fear:"
Many other statements from Osteen during the Larry King interview were blatantly in opposition to the Word of God. KING: But you're not fire and brimstone, right? You're not pound the decks and hell and damnation? Friend, the greatest "fire and brimstone" preacher that ever lived was the Lord Jesus! He preached about hell more than any other subject. If you don’t believe in proclaiming "fire and brimstone, as Osteen openly confesses, you do not believe the Bible! It’s that simple. Jesus Christ took hell so serious — He could say without the slightest hesitation — to remove your eye, cut off your hand or foot, if that would keep you out of hell! If hell is not real — Jesus Christ was the most deceived man that ever lived! Osteen may sound pious and sweet to say, ". . . I don't have it in my heart to condemn people," but according to the Lord Jesus, they are already condemned. The Lord says in John 3:18, "He that believeth on him is not condemned: but he that believeth not is condemned already, because he hath not believed in the name of the only begotten Son of God." The Christian’s message is not condemnation, but the way out of ALREADY condemnation. If there is no "hell fire and brimstone"—there is no reason for Jesus dieing on the cross. It was a waste. Hell is as much a part of the gospel, as the blood of Jesus Christ. No hell. No blood. No heaven. No gospel. . . Friend, if we believe the Bible it is our duty and decency to warn people about hell! Warning someone of the fires of eternal hell is not condemning them - it is just the opposite - we are trying to keep them from being condemned in hell! KING: You believe in the Bible literally? OSTEEN: I do, I do. There is a problem here - a very, very serious problem. Here is a man that claims to believe the Bible literally. And the Bible over and over and over, warns of a place of called hell, a place of eternal fire and torments where the majority of people will suffer in torments for all eternity. Charlie Peace was a criminal. Laws of God or man curbed him not. Finally the law caught up with him, and he was condemned to death. On the fatal morning in Armley Jail, Leeds, England, he was taken on the death-walk. Before him went the prison chaplain, routinely and sleepily reading some Bible verses. The criminal touched the preacher and asked what he was reading. "The Consolations of Religion," was the replay. Charlie Peace was shocked at the way he professionally read about hell. Could a man be so unmoved under the very shadow of the scaffold as to lead a fellow-human there and yet, dry-eyed, read of a pit that has no bottom into which this fellow must fall? Could this preacher believe the words that there is an eternal fire that never consumes its victims, and yet slide over the phrase with a tremor? Is a man human at all who can say with no tears, "You will be eternally dying and yet never know the relief that death brings"? All this was too much for Charlie Peace. So he preached. Listen to his on-the-eve-of-hell sermon. Is it possible that a man could be so cruel and so criminal to actually believe in hell and steadfastly refuse to warn fellow human beings? Recently, a local TV station interviewed a man that rescued a sleeping family from a burning house. He was riding by the house, saw the raging fire and at the danger of his own life, ran inside the flaming house, screamming and yelling for the family to wake up and get out! The newscaster asked him, "How does it feel to be a hero?" His reply was simply, "I'm no hero; I just did what any decent human being would have done."." Here me and here me well - a man that professes to believe the Bible and refuses to warn people about hell; either does not really believe that Bible, or they are the worse criminal and villain on this earth! And I don't care how big a church they have, or how nice, sweet, loving, compassionate or pious they may sound - they are a wicked devil in disguise! And who walk in the midnight gloom? Will you bear some light to their darkened mind? Will you tell them their coming doom? Will you seek them now, Will you seek them now? Will you show them the way? Will you show them the way? Some one may be lost, That you might lead home, To that bright land of perfect day. In the interview, Larry King tossed Osteen another "soft-ball," asking Osteen about the wicked and vile sins of abortion and homosexuality. Even lost people take a stand on these blatant "sins." The word "sin" occurs in the King James Bible over 830 times! After the previous surprising answers, Larry then asks Osteen the obvious question: Do you believe the Bible? OSTEEN: I don't think it's that hard. To me it's fun. We have joy and happiness. Our family -- I don't feel like that at all. I'm not trying to follow a set of rules and stuff. I'm just living my life. KING: But you have rules, don't you? OSTEEN: We do have rules. But the main rule to me is to honor God with your life. To live a life of integrity. Not be selfish. You know, help others. But that's really the essence of the Christian faith. Stay away from Joel Osteen and his no condemnation, self-esteem, false-gospel. Warn others. Stay away! There is too much at stake – your eternal soul. Joel Osteen - False Prophet Warning!